If you own 1 TV Set but more than 1 audio and video devices, this 3 Way (3 In 1 Out) component AV Switch is autofit to you. Connect 3 audio and video devices (such as Xbox 360, Wii, PS3, DVD to the "Input 1, 2, 3" connectors while your TV to the "Output" connector. Then, at once you want to use one of the 4 connected devices, just press the relative button "1, 2, 3" rather than discommodiously reconnect the audio and video devices again and again. Brand new and high quality guarantee. Trichromatic aberration, high clear image. No power supply and software drive needed. 4 standard "Y-Pb/cd-Pr/cr, L-Audio-R", 3 in 1 out. Convenient operation, just press the relative button "1, 2, 3" when you want to use one of the four connected devices. Easy connection, simply connect 3 audio & video devices (such as Xbox 360, Wii, PS3, DVD) to the "Input 1, 2, 3" connectors while your TV to the "Output" connector. 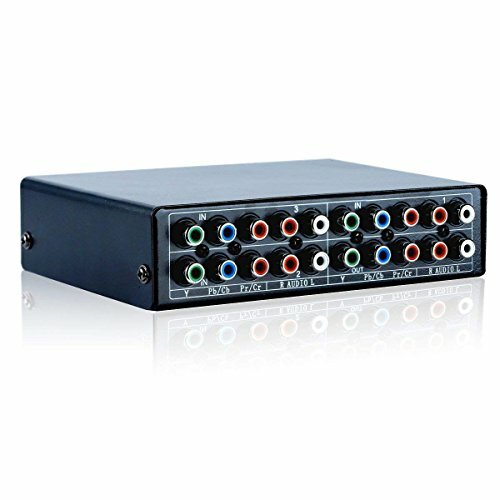 Interface Type: 4 standard "Y-Pb/cd-Pr/cr, L-Audio-R"
1 x 3 In 1 Out RGB Selector x 1.